Soft Skull Press, 9781593766276, 304pp. Richard Hell may best be known as a punk icon, a founding member of seminal bands Television, the Heartbreakers, and The Voidoids, but for decades he's been a prominent voice in American letters. Through his novels Go Now and Godlike, and his critically acclaimed autobiography, I Dreamed I Was a Very Clean Tramp, Hell has proven himself as a talented and insightful writer across many genres, in many forms. But one might argue that Richard's true genius lies in shorter form as a writer on culture. "Love comes in spurts," Hell once sang, and that could well describe the intensity of his penetrating and wickedly droll criticism. 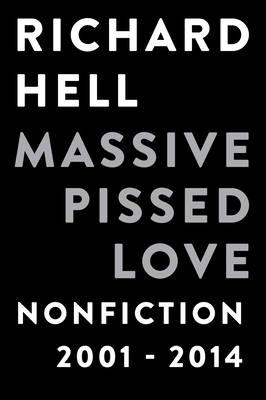 Massive Pissed Love is a collection of Hell's ruminations on art, literature, and music, among other things, that's like a candy box of reading treats, a bag of shiny marbles, a cabinet of mementos and uncanny fetishes. However one thinks of it, it's a joy to read from start to finish and a deeply necessary addition to the oeuvre of one of the sharpest minds and sensibilities at work today. Richard Hell remains a crucial voice of our culture. He's currently conducting an interview/performance series at Symphony Space in New York, "A Night Out with Richard Hell," as well as giving readings and talks internationally, while focusing primarily on a novel in progress. He's published journalism in Spin, Bookforum, The New York Times, Esquire, the Village Voice, Art in America, and many other outlets. Hell was the film critic for Black Book from 2004-2006. He's the author of an autobiography, I Dreamed I Was a Very Clean Tramp (Ecco, 2013), and the novels Go Now (Scribner, 1996) and Godlike (Akashic, 2005), as well as the collection of essays, diaries, and lyrics Hot and Cold (powerHouse, 2001).